Brendan Sheehan and Danny Mahoney have been selected as Medford (Mass.) All-Stars. 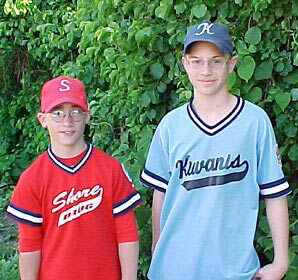 The two cousins, nephews of Sheehan World Publisher Kathy Sheehan, had awesome seasons with their respective teams in Medford this year. Brendan played second base on the Shore Drug team this spring, hitting a grand slam in one game late in the season and becoming the best hitter on the team with a .508 batting average. He struck out only six times in the whole season, including the city series and the playoffs. Danny, an ambidextrous pitcher and power hitter, has played for Kiwanis for several years. Earlier this year, he came in second in the Medford Little League Home-Run Derby. The Medford All-Star Team will be playing in more than a single game. The team competes against other All-Star teams throughout Massachusetts. The final game will be the Little League World Series in Williamsport, Penna. Chuck Dingée, an uncle of the two 12-year-olds, has predicted the pair will not only lead their team to the Little League World Series, but that Danny and Brendan will be playing for the Red Sox in just a few years.